Having tasted many 1999 Tuscan reds, I've been reasonably impressed by a number of wines from this vintage. The winter was rather dry, with rains coming AFTER the vines flowered and set a crop. The early summer months were cooler than normal, with July being the wettest month of the entire year! The heat arrived in early August and pushed the fruit towards maturity. By the end of September, most estates were in full swing with Sangiovese harvesting, most completing their picking by the second week of October. We assembled a varied group of wines. We covered a few notable Super-Tuscans, along with a Vino Nobile, Chianti Classico and Chianti Rufina wines. Many of the wines had been "enhanced" (if you want to call it that) with Cabernet or Merlot. Many have been matured in small oak barrels and all are wines carrying premium price tags. The overall quality was quite good, making for some close "horse races." Two wines were ahead of the pack, separated by a mere one point (virtually tied). Only the two top ranking wines had no last place votes. 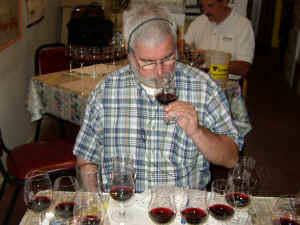 The tasting was a real "beauty contest," since each wine received a huge range of rankings. Notes by Bob Gorman with Gerald Weisl assisting. "Notes of green olive (from Cabernet? )," said one taster, "along with notes of sulfur on the nose and 'Cheracol' (editor's note: a cough medicine) on the palate." Another found the wine "weak, bitter and lacking focus." "Fruit notes faded in the glass," said another. the palate as it had a characteristically nice little orange-peel element but that's not enough." Gerald found "a touch of anise and cherry on the nose...more reminding me of a good Chianti than a 'Super'-Tuscan. It's a bit rustic on the palate (!) showing Sangiovese notes but with a bit of tannin and some 'bite.' One-and-a-half stars on my three star scale, no stars being standard or ordinary." "Coffee grounds on the nose but tart and not much to it"
"This wine has good fruit, balance, and intensity." "The wine has cherry/raspberry fruit, oak on the nose but it collapses on the palate." Another found "metallic and weedy notes." Bob found "a Tuscan soul peeking through all that oak veneer from small barrel aging with some characteristically Sangiovese fruit of cherries and cherry pits. Some notes of 'crme brle' came up as it sat in the glass. You're greeted with fine but insistent tannins and Sangiovese fruit skins and orange zest. Nice enough but the fruit trails off." Gerald found a particular type of oak treatment here, noting the wine is "mildly smoky and woodsy with a burnt element to it. It's a bit aggressively tannic and a shade shallow for all that astringent muscle. One-half star to one star rating." The best that could be said for this wine was that it had a "pleasing rubber/tar note, medium to light in body" although another perceived this aromatic as "sulfur." Another found it "flat, low in acid, simple, grippy and coarse. It's particularly disappointing on the palate." Another called it "skinny and lacking in fruit." Bob found "lots of sweet spice from the oak (very 'international' Where in the world of wine are we?!) Oak dominates on the palate too; I'll swear there's some Merlot in there and not working well with the Sangiovese. It has a flat, alkaline finish." Gerald was more enchanted by this wine, finding "plenty of good Sangiovese fruit which shines brightly. There's a pleasant cedary note surrounding this. One the palate the wine also displays 'Sangiovese,' with lots of cherry fruit. A bit of backbone here and mild tannins...very charming. Two stars." 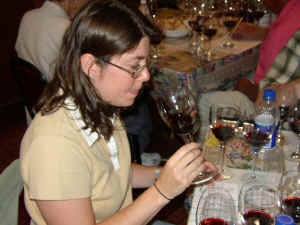 Although the wine is purported to be "100% Sangiovese" one taster found "distinct notes of Cabernet which seemed to dominate the Sangiovese component; nice wine!" "There are cherry and herbal notes to the fruit with hints of tobacco; it has a nice intensity." Another found "nice mild fruits but on the palate, the fruit tannins came up in a big wave - a bit much." focus, varietal character; it has it all!" Bob found "tight, even shrill, Sangiovese fruit dominating with a trace of leather, tasting very much like a 'Super-Tuscan'. It has a delicious entry with oak sweetening the Sangiovese fruit nicely; nice length, concentration and even a nice slightly bitter finish." 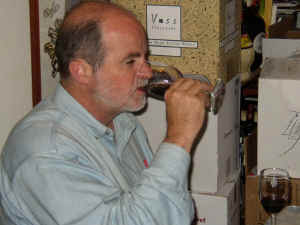 Gerald liked the "hint of earthiness and cherry fruit on the nose. There's also a light cedar note and a touch of spice. It's a moderately tannic red with a bit of 'bite', but not particularly lengthy or complex on the palate. One star." One taster described this as having "spice, mint, leather on the nose but the palate is poorly integrated." This was echoed by another who found "blackberry and spice on the nose but was a bit watery on the palate." Another complained "There's nothing to it!" One taster, though, felt this had "good fruit and it fleshed out with time in the glass." Bob was very impressed! "It has that classic Sangiovese tang: there's hazelnut, orange peel, red fruits, trace wet leather (Brettanomyces), spice, cherries and oak up nicely too - very complex nose. And some mouthful too! with ripe tannins, deep Sangiovese fruit, nice acid, no pesky Merlot showing, balanced; orange peel finish; classically Tuscan!" Gerald enjoyed the "sweet fruit on the nose which was reminiscent of cherries and berries. It's got a nice fragrance from the oak, too. Snappy, zesty and typically Sangiovese on the palate. There's a nice tangy quality from the acidity. Good food wine. Two stars." One taster liked how "the wine changed and developed in the glass. It started off 'earthy' but then showed leather and finally chocolate; nicely balanced and long." Bob found "Tuscan 'terroir', a trace of wet leather from Brettanomyces, ripe, spicy Sangiovese fruit emphasizing red fruit skins. The fruit gets brighter as it opens. It has appropriately high acid for Toscana with deep Sangiovese fruit, tough but correct tannins and LONG!" Gerald described the nose as a "bit meaty with decent fruit and a nice balance of oak. The palate is berryish and woodsy with a fair bit of tannin. It needs some beef or lamb to cut the tannins. One-and-a-half stars." Proponents of this wine were fairly reticent, one taster finding "a long finish and typically Sangiovese...The best!" The nays reported "short, sharp fruit" and "sharp, hot and tannic." A more favorable taster thought it "late harvest Zin-like, oak on the nose and lots of stuff in the glass." Bob reported a "pretty French oak component from small barrels but too much! There's a cardboard-like, somewhat leesy character here. Are the cherries from the Sangiovese or the Merlot? The wine is highly extracted but even the small percentage of Merlot can't sweeten the Sangiovese's bitter tannins. The wine might just need time to develop." Gerald liked the "deep black fruit aromas and vanillin, oak bouquet here. It's a very showy wine! The wine is equally showy on the palate, being plump, robust and moderately tannic. Two stars." This wine was liked for "having lots of oak, sweet fruit (cherries especially)." Another liked its "smoky quality, with dark cherries and blackberries." Another found a "powerhouse of a wine but tannins are a bit much." Another thought that it was "an easy winner at first but then it kept fading in the glass." 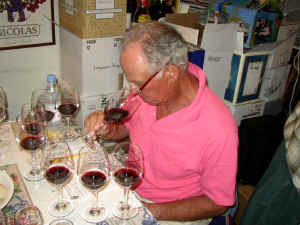 Bob found "depth of sweet spice and Sangiovese fruit that has that 'tang' of fruit pits. Sweet ('barriques') oak shows nicely and a coffee/toffee note now from the malolactic fermentation. Tight, zesty, very Toscana! The Sangiovese fruit shines out. It's nicely concentrated but it finishes a bit flat." Gerald marked this down for its "ripe, almost pruney fruit character...very jammy at first with some berry and plum notes, too. The modest amount of tannin on the palate saves the wine, keeping it from being totally 'flat.' It's not a wine for cellaring and ought to be very appealing to those just discovering some of the upscale wines of Tuscany. One to one-and-a-half stars."